All those responsible for leading this young woman to this act of shamelessness have a great deal to answer for. In the 1960s, everyone was avidly reading Anaïs Nin. Among the budding feminists of the time, her words were holy writ. In many ways, Nin was the mother (if the metaphor can be forgiven here) of the radical feminists that were soon to emerge, and under whose influence countless young women, like the one pictured above, were catechized and robbed of both their feminity and their dignity. 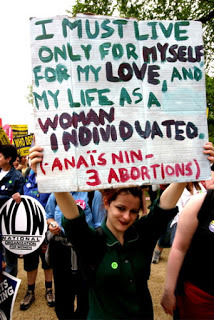 This entry was posted in Blog and tagged abortion, Anais Nin, radical feminism, Roe v Wade, sexual revolution. Bookmark the permalink.